Located in the foothills of the Italian Alps, this tranquil, light-filled space is home to ArsalitArtes, an arts and crafts collective that creates contemporary homeware using age-old techniques. The studio was founded by Michela Cavagna, an architect and art director, and designer Marina Maffei. The remote location of their atelier is telling – the local area was once at the heart of a thriving wool and textile industry. Now, the low prices of imported fabrics and clothing make it virtually impossible for Italy’s family-run businesses to compete; historic factories stand empty, industrial equipment gathers on the roadsides and once- bustling villages feel like ghost towns. This pioneering spirit and determination to preserve Italy’s industrial and cultural heritage permeates every project undertaken by the pair, who work with a small team of artisans in the old village schoolhouse in Camandona. Here, Marina tells us more about the studio. What can you see from your window? I see snow-capped mountains, maple, oak and chestnut trees, tall pines and a vast, ever-changing sky. Did you have to do a lot to the building? The interior is original and the proportions are very grand. We haven’t changed anything; the decor and furniture are the same as when we moved in. We just moved a few things around to create the perfect workspace. We wanted to make use of what was already here. Tell us a bit about your work. Our atelier produces textiles, wooden benches, cushions and carpets. We have a very short, local production chain and our work is a mixture of self-production and sustainable design. We use traditional handlooms and locally sourced Italian wool, much of which would usually be discarded as waste by the shepherds. How would you describe the space you’ve created? Our style is raw but refined. We love details and like to create contrast by pairing pale ceramics with dark textiles, or delicate linens with rough wooden benches. 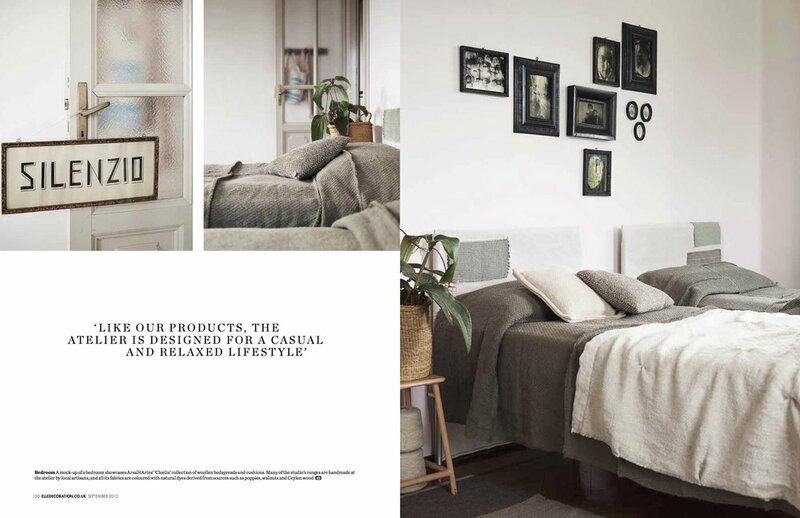 Like our products, the atelier is designed for a casual and relaxed lifestyle. How do visitors react when they come to the atelier? Everyone who visits wants to try the old handloom, which has got us thinking about running weaving workshops here. And they’re really curious about the processes behind what we make; they love to touch all the textiles and they want to see how we do things.